The Port’s goal in creating the Waterfront Vision and Master Plan was to design for the future what could be a lively, walkable place with community gathering and character spaces, commercial, retail, mixed-use, and residential uses. 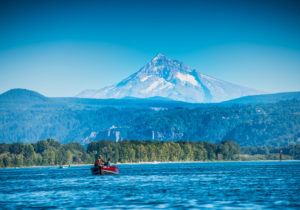 The design and function for the development would honor the natural beauty and history of the site and the community; along with supporting the creation of a local and regional identity for the Cities of Washougal and Camas. The Leland Consulting Group was chosen as the Port's strategic advisors in January and will assist staff in the interview process for a Waterfront Developer. The current waterfront development timeline includes the following projects. Sign up for our newsletter to receive regular updates on the Port of Camas-Washougal’s Waterfront at Parkers Landing. 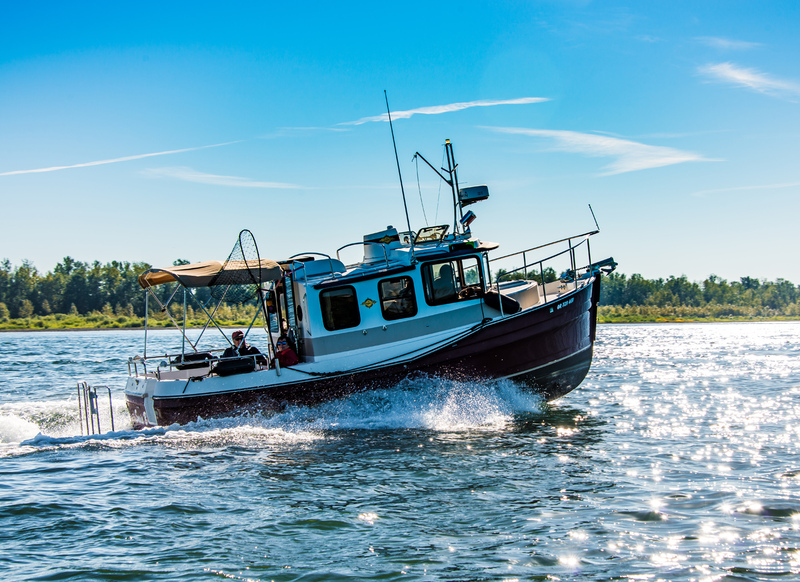 The Waterfront Property was a former lumber mill, operated by Hambleton Lumber Company since 1953. Hambleton Lumber Company operated in a niche market with approximately 75 percent of the mill production in large dimension green Douglas fir, hemlock and spruce timbers. Because of economic conditions, the cutting mill closed in 2010. 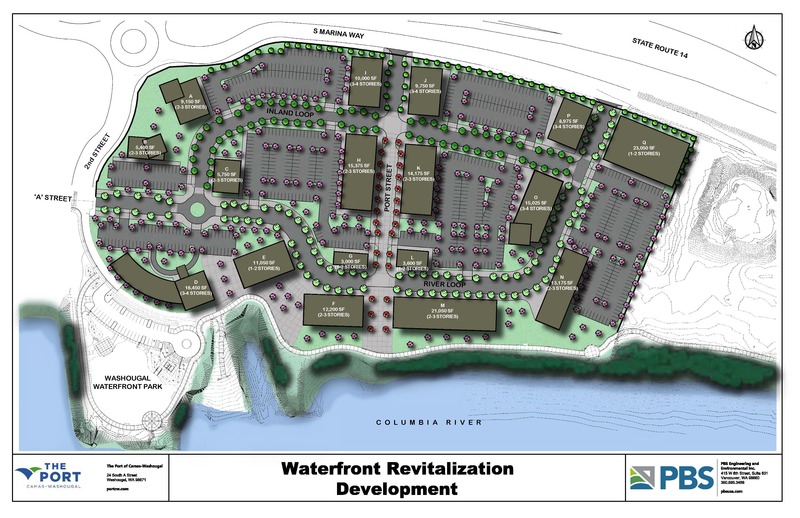 In 2011, The Port secured a $200,000 Integrated Planning Grant (IPG) to evaluate the environmental condition of the waterfront property, that the former mill was located on. Maul Foster & Alongi, an environmental consulting firm out of Vancouver, led the IPG process, which included determining the extent of contamination along with how the clean-up process would be performed, obtaining grant funding for the cleanup, construction oversight, and post-construction monitoring. It was determined that contamination was minimal due to Hambleton Lumber Company’s strong environmental values as demonstrated through their certification through the Forest Stewardship Council (FSC) as a manufacturer. 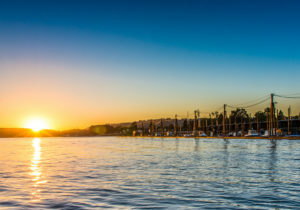 In 2012, Killian Pacific purchased the entire 27-acre parcel and subsequently, the Port acquired 13.25 acres of the waterfront portion of the property from Killian Pacific. The goal was to bring the waterfront property to a higher and better use for the community to access. In August 2014, using Department of Ecology grant funding ($516,523), the site cleanup began. Local contractor McDonald Excavating, Inc. performed the cleanup which included removal and proper disposal of pond water, consolidation of impacted material in the log pond, and backfilling with non-impacted and imported backfill. The log pond, mill area, and aggregate recycling area were capped with at least two feet of clean backfill, including a geotextile demarcation layer, followed by final grading of the site and hydroseeding. Monitoring wells were also decommissioned. 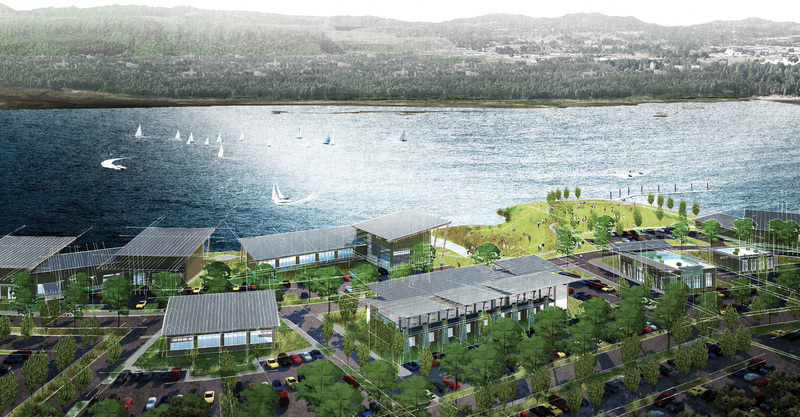 In 2013, the Port Commission agreed to begin design work of the future waterfront park and trail along the shoreline of the waterfront property. Berger/ABAM, a construction engineering firm out of Vancouver, was tasked with designing the park and trail. 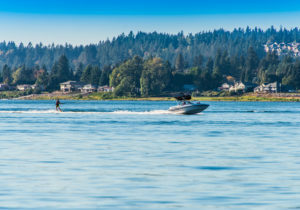 The Washougal Waterfront trail is a critical connector trail to both downtown Washougal and Camas areas through a regional trail system beginning at Lacamas Heritage Trail and extending through the Lacamas Park Trail system, the Washougal River Greenway Trail, the Port Marina Park and Historical Park, Steamboat Landing, the Levee Trail, Steigerwald Lake Wildlife Refuge Trail and finally to the Gorge Towns to Trail system in the scenic Columbia River Gorge. In 2015, the Port was awarded $1.7M in grant funding from the Recreation and Conservation Office for the construction of the new park and trail. Construction began in early 2016, with Tapani, Inc. as the contractor. Construction was completed in Fall 2016 and the Grand Opening of the Washougal Waterfront Park & Trail occurred in October 2016. 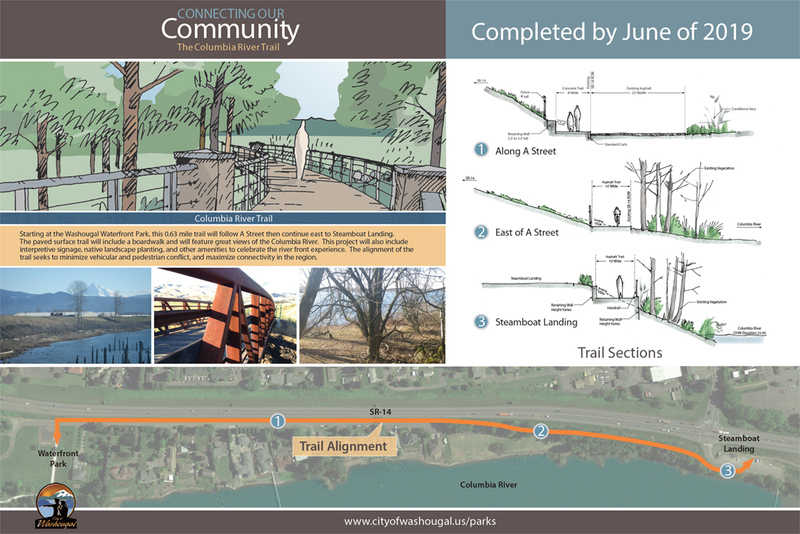 The Washougal Waterfront trail is identified as Phase 1, with the City of Washougal completing Phase 2 of the trail in 2019, which will connect people from the waterfront to Steamboat Landing. The newest coming addition to the waterfront will be the Natural Play Area which will be constructed in 2019. It will be a magical place for Sasquatch, named Eegah, to share with guests. 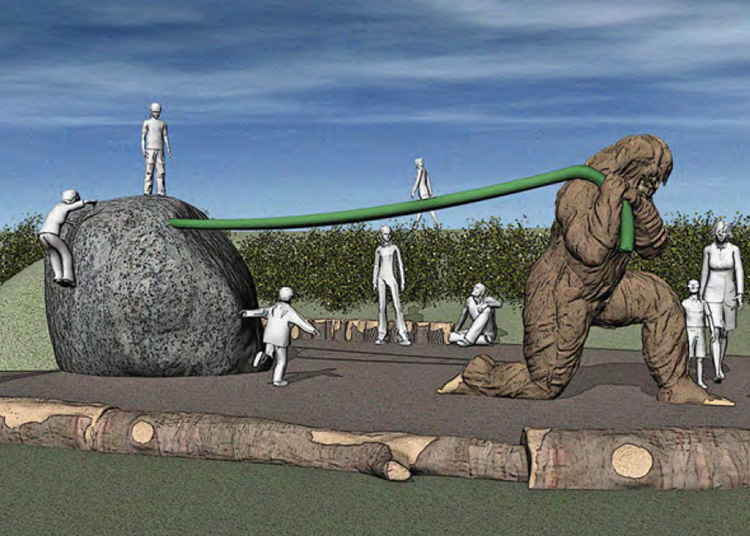 It will include a hill-side slide, log steppers, xylophone, drums, a boulder maze, log balancing beams and don’t forget a fun climbing rope Sasquatch will use to play tug-a-war with Erric the Erratic. The trail follows the Columbia River from Steamboat Landing Park to the border of the Steigerwald Lake National Wildlife Refuge. 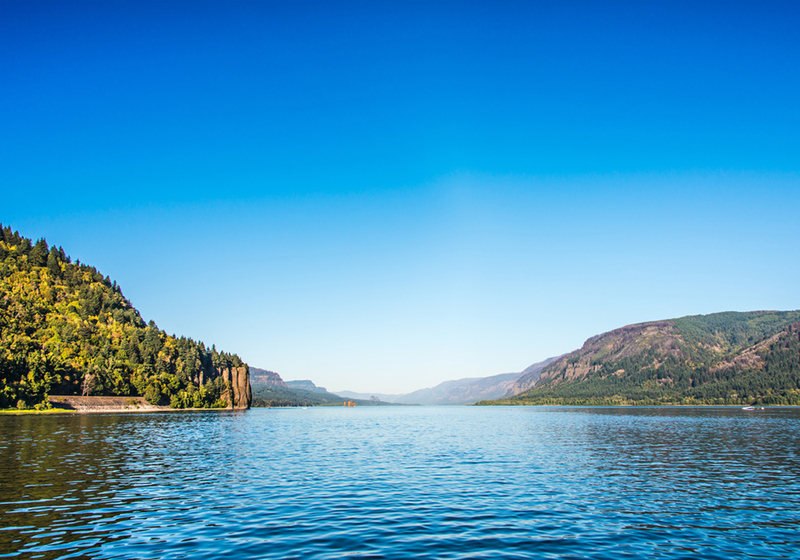 The trail parallels Cottonwood Beach and is named for Lewis and Clark, who camped there in 1806. Walkers may enjoy taking a partial loopback on the Gibbons Creek Wildlife Trail in the adjacent wildlife area. This 2.2-mile paved trail from Goot Park to Lacamas Creek Park is great for a leisurely walk or a fast bike ride. The trail crosses the Washougal river with a long arching trail bridge with scenic views both upstream and downstream. The trail offers access for bank fishing and wildlife observation and has a concrete walkway over a wetland area. The 12-foot wide cement trail wraps completely around the park and stretches just under a mile long. 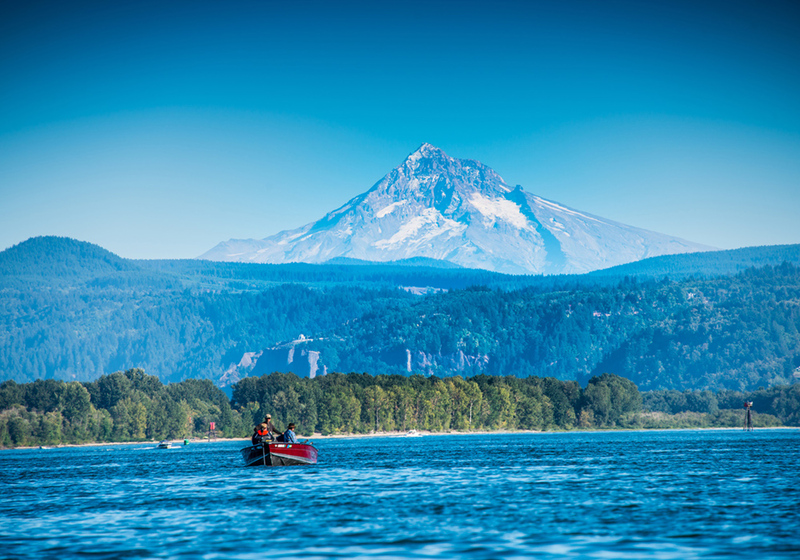 Along the trail, there are a non-motorized kayak/canoe launch, viewpoints, interpretive signage, and water access trails for those hoping to get closer to our beautiful Columbia River. 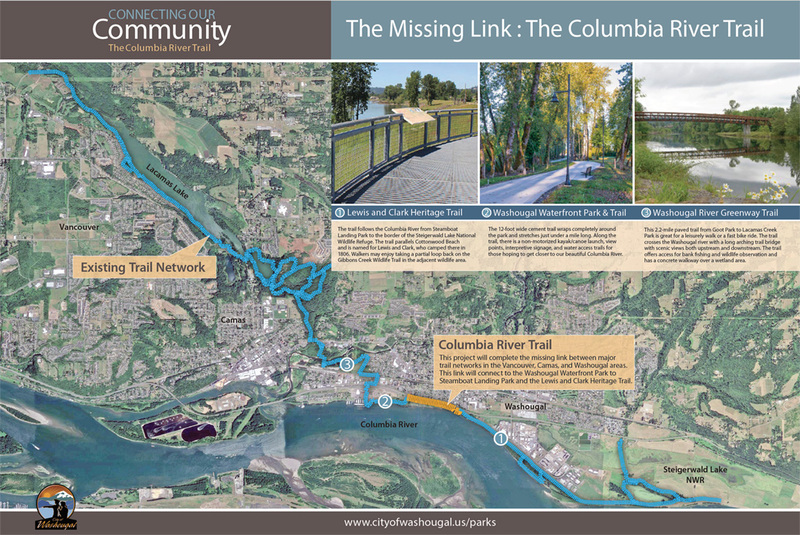 This project will complete the missing link between major trail networks in the Vancouver, Camas, and Washougal areas. 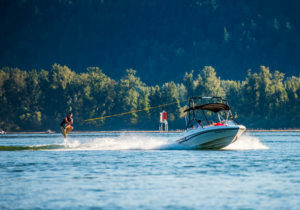 This link will connect to the Washougal Waterfront Park to Steamboat Landing Park and the Lewis and Clark Heritage Trail. Starting at the Washougal Waterfront Park, this 0.63-mile trail will follow A Street then continue east to Steamboat Landing. 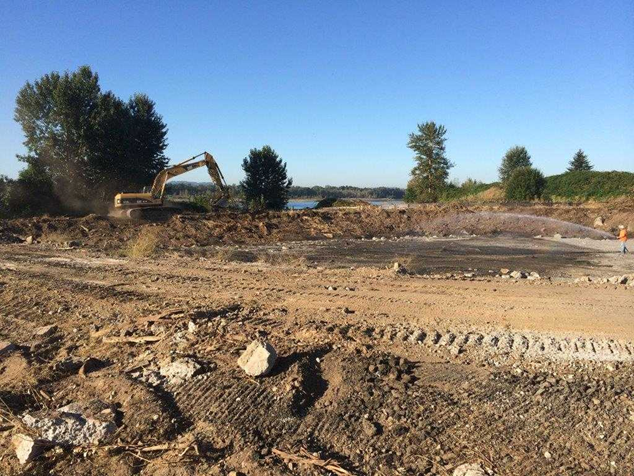 The paved surface trail will include a boardwalk and will feature great views of the Columbia River. This project will also include interpretive signage, native landscape planting, and other amenities to celebrate the riverfront experience. The alignment of the trail seeks to minimize vehicular and pedestrian conflict and maximize connectivity in the region. 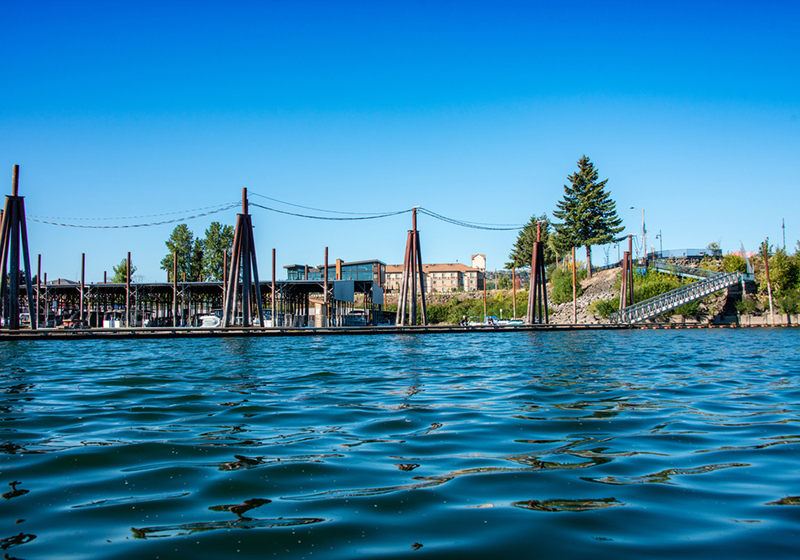 The Port of Camas-Washougal Marina is located just to the west of the Waterfront at Parkers Landing. 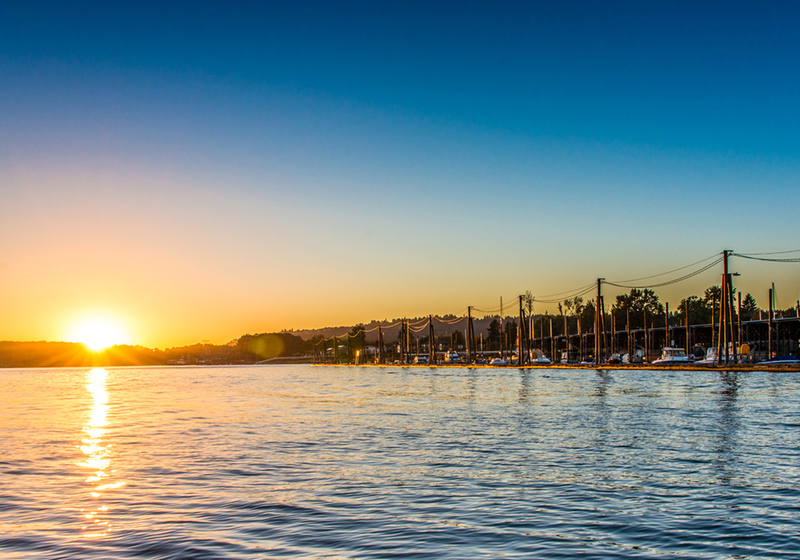 The proximity of these locations allows for an expanded audience with the addition of waterway travel. 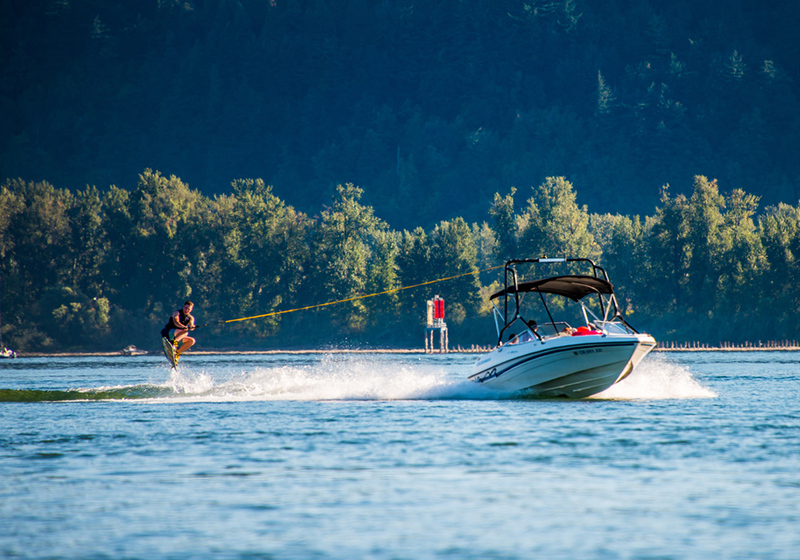 Transitory boaters coming to the Marina for the day can access the Waterfront at Parkers Landing via the breakwater dock that connects to the Washougal Waterfront Park & Trail. Tenants leasing one of the 380 boat and jet-ski slips in the Marina have just a short 700ft walk to access the waterfront development. 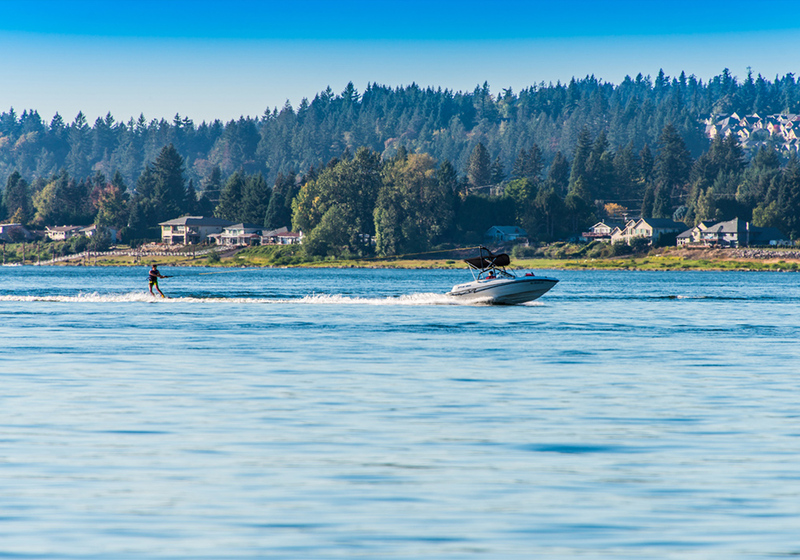 Activity abounds with recreational boaters, jet ski enthusiasts, and non-motorized canoe and kayak users. 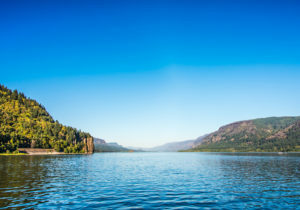 With a visual landscape of the entrance to the Columbia River Gorge Scenic Area, your oasis awaits here at the Waterfront at Parkers Landing!